Blogger Templates - Seventheme Responsive Templates Bloggers have a lot of people who know Seventheme templates, from various sites. Often several people do this Seventheme Redesign Template, in this article I will share one of the Responsive Grid version redesign works by galihdesign.com for free! 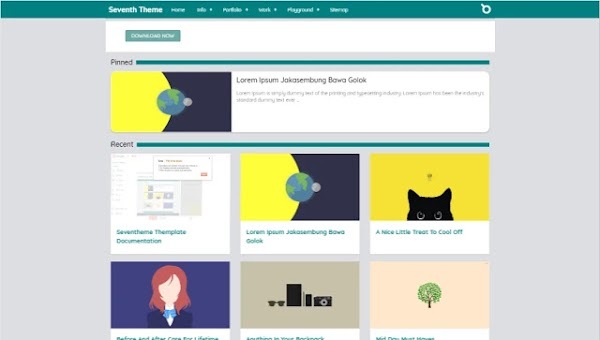 Responsive Template This Sevetheme feature has features that qualify in templates in general. If you are curious about the features that are owned by Seventheme Responsive Templates. What after you see the features that the Responsive Seventheme Template has? It must be haha. Want to see more clearly how the Seventheme Respinsive looks like this template? Check the demo, and if you want to download the beauty of this template, check for free below!